So what do you do with left over sundal? 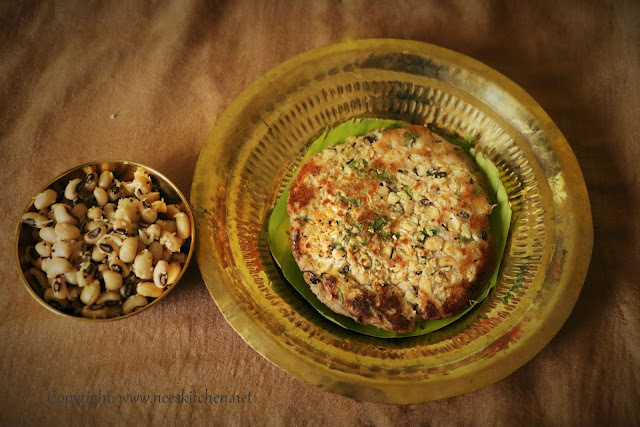 Try this yummy Sundal uttapam which is made using your regular dosa batter, ragi flour and left over sundal. 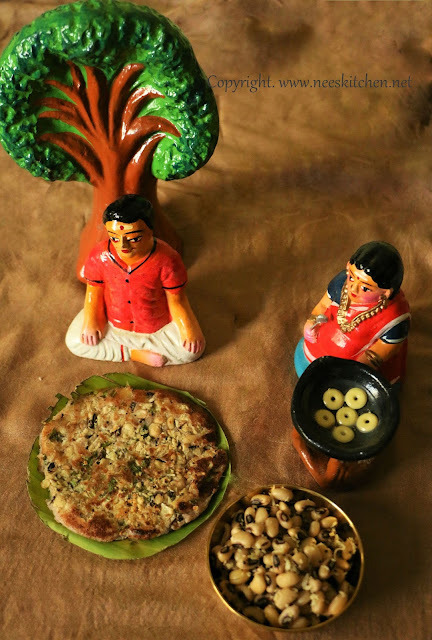 We would have invited guests for golu, however many times all of them cannot turn up due to sudden guests at their home ,traffic jam’s, cannot step out of office etc etc. We cannot blame anyone as we also do the same with few houses where we are invited. Nothing is planned this whole week !!!!. Moreover Navarathri is a time where we do not prefer to carry forward the food the next day. Finally we land up consuming all the sundal by ourselves and most of the times it is not shared equally by all family members. 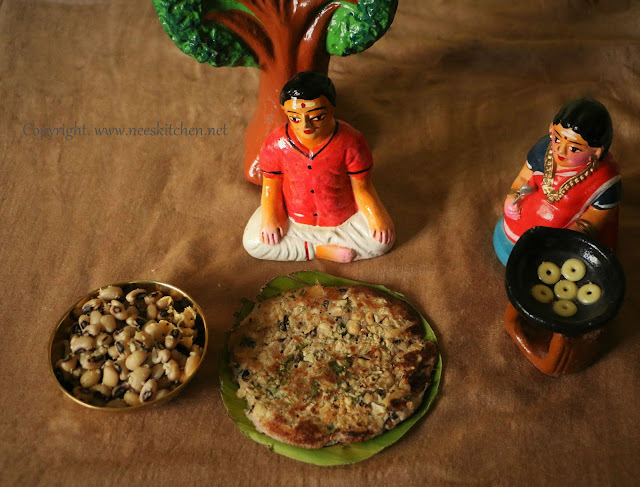 In this post, I used Karamani (Lobia) to make uttappam. You may also replace with chickpeas, green peas or any similar varieties. Since we receive varieties from other houses, we may also mix all of them and use. Sweet sundal should not be used for this recipe. Any regular dosa/idly batter would do. Make sure to remove the red chili from the sundal before using it for uttapam else it would become super spicy. Sprinkle a lot of coriander leaves to get some freshness to the taste. 1. Wash and soak Karamani for 6 hrs. 2. Pressure cook Karamani for 2 whistles with enough water. 3. Strain the water and keep the karamani ready for cooking. 4. Take a pan, add coconut oil and once it is hot add hing, mustard ,dry red chili, cumin seeds. 5. Add the cooked karamani and salt. Cook for few minutes. 6. Add curry leaves and mix well. Karamani sundal is ready. 7. Prepare the dosa/idli batter in regular way. 8. Take 1 tsp of ragi powder and mix with 1 cup of dosa batter. Mix well adding a pinch of salt. 10. Crush the karamani sundal roughly using a spoon or hands. Do not blend in a mixer as a fine paste. The sundal must be course. Remove the red chili. 11. Take a dosa or uttapam pan. Add the crushed sundal and coriander leaves. 12. Immediately add the dosa-ragi batter. 13. Allow it to cook by adding oil in the corners and closing it with a lid. 14. Flip around and let it cook on both the sides. Serve hot with a good chutney or sambar. - > Do not blend the sundal in the mixer.